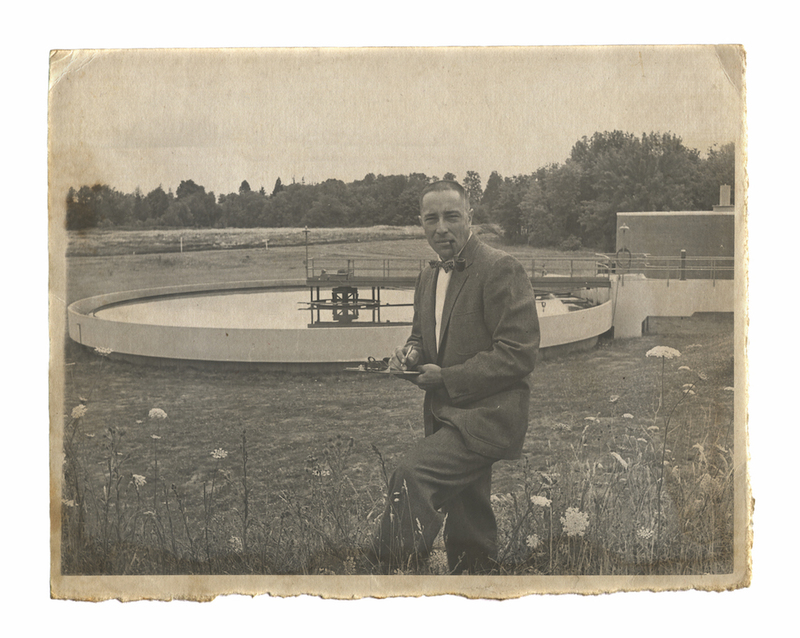 Fred J. Burgess at the Corvallis wastewater treatment plant in 1960. He became a member of the Oregon State Engineering Hall of Fame in 1998. Thirty-five years ago, Fred J. Burgess (’50 B.S., Civil Engineering), the fifth dean of the College of Engineering at Oregon State University, told a reporter that he envisaged a telecommunications network that could break through the physical barriers of the university. “Our [professors] could lecture to classes on other campuses as well as ours,” Burgess said, seven years before most people had heard of the World Wide Web and decades before electronic distance learning became ubiquitous. In 1971, when the 2,000-plus students enrolled in the College of Engineering included only 17 women, he resolutely championed for increasing female enrollment and scoffed at the suggestion that women could not handle an engineering career while raising a family. Three years later, the number of women studying engineering quadrupled. Such prophetic leadership was typical of Burgess over his 36-year career. He saw the path forward with astounding clarity — and took it: He anticipated the value of forging ties between research universities and industry and reached out to the business community to build enduring, productive connections that he called “the wave of the future.” Burgess understood that paid internships — a rarity at the time — would become an integral component of a high-quality engineering education. His passion to preserve and protect clean water made him an environmentalist well ahead of the times. He persuaded the Federal Water Pollution Control Administration (an EPA predecessor) to build a multimillion-dollar research lab on the western edge of campus in 1966. The building now houses the EPA’s Western Ecology Division. He was instrumental in securing the university’s Sea Grant status and selecting the location for the Oregon State Marine Science Center at Newport. Burgess contributed to the development of the university’s Environmental Health Science program, expanded the college’s Ocean Engineering program, and played a major role in building the nationally recognized O.H. Hinsdale Wave Research Laboratory. He also secured funding for the ECE building (renamed Owen Hall in 2009), the last Oregon State structure paid for entirely by the state. And he carefully piloted the college through a tough economy and severe budget cutbacks during the 1980s. Burgess was born in La Grande, Oregon, in 1926. He grew up on the family farm and performed the typical chores, but especially enjoyed brewing beer with his grandmother. He hunted deer and elk to put food on the table and raised rabbits to sell. Burgess began Navy pilot training in 1943, but as the wartime need for aviators began to dwindle, he was transferred to an officer’s training program. Ensign Burgess was then assigned to the USS Bausell, based in San Diego, to complete the last 14 months of his service patrolling the Pacific aboard the brand-new destroyer. The military issued him an honorable discharge in August 1947. In 1949, Burgess married Earlene DeLashmutt, a young woman studying at Linfield College. Their marriage lasted more than 50 years, and they raised a son and two daughters. Burgess earned his bachelor’s in civil engineering from Oregon State the following year and, after working a couple of jobs in the water pollution control field, he joined Oregon State faculty as an instructor in 1953. Then, backed by a full scholarship, he earned a master’s degree from Harvard University in environmental engineering and returned to Oregon State in 1955 to teach and conduct research. Burgess became acting dean for engineering research in 1962 and rose to the rank of professor and head of Civil Engineering in 1966. He was named dean of the College of Engineering in 1970, a position he held for 19 years until his retirement in 1990. During that tenure, enrollment in the college grew from 1,800 to nearly 4,000 students. Burgess handed diplomas to more than 7,200 graduates, many of whom he knew by name — including two of his children. In 1974, Oregon Gov. Tom McCall, a pioneer of environmental causes, appointed Burgess to chair committees to ensure public access to Oregon beaches and find alternatives to the choking practice of field burning. Throughout his career, Burgess advocated an interdisciplinary approach to problem-solving, which would become the collaborative model to emulate in academia. Colleagues appreciated his strong yet humorous approach to life and work. Fortunately, he lived to witness yet another of his prescient visions become reality. Fred J. Burgess died in 2011.